Have you ever had a relapse from exercise? You know, you’d been going to the gym three times a week for 45 minutes each time but one day, you forgot. And, after that, you never managed to re-establish the habit. And, finally, what about the subject that most interests me — writing? I know many people — some of them clients — who resolve to write for x number of minutes or produce x number of words each day and then they fall off the wagon. They feel horrible about the failure. They beat themselves up, calling themselves inept and undisciplined. And, funnily enough, none of this name calling helps them restore their writing habit. Yeah, I know. You had such great plans. You intended to do better. You wanted to become a New York Times bestselling author. But your book stalled at 17,000 words and you gave up. Well, great news! Now you have a do-over. Retain what you learned from your previous failure to write and let go of the idea that you’ll never be able to succeed. Remind yourself that mistakes and failures are part of being human. Those failures are simply a stepping stone on your path. 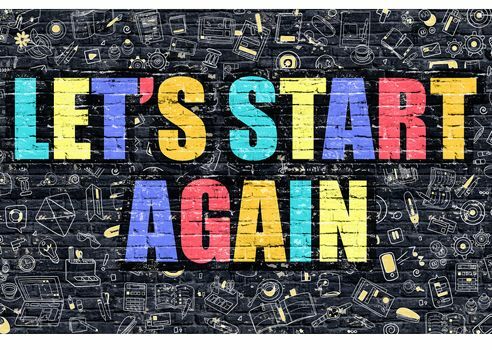 Beginning again may be painful — especially if you’re doing it for the 154th time — but think about the alternative: not beginning again. Isn’t that worse? If you begin again, no matter how many times it takes you, eventually you will complete what you started. Writing doesn’t happen by magic. Nor does it depend on inspiration. You need to make an appointment with yourself for writing, and do it whether you feel like it or not. Put your writing appointment on your calendar, ideally at the same time of day, every day. Don’t schedule your writing for times when you’re typically tired, worn out or busy with other responsibilities. If you’re a morning person, write when you first get up, before the phone starts to ring or before the kids demand breakfast. If you’re a night owl, write after everyone else has gone to bed, when the house is as quiet as a library. But schedule this appointment and honour it as if it were a meeting with an important business associate. Many people I speak with seem to think that writing doesn’t count if you don’t spend an hour or more at it. They are wrong! Five minutes a day is enough to begin. (Remember: writing is like exercising. You need to condition yourself before you run a 10-km race or write for 60 minutes.) You can eventually work yourself up an hour of writing per day if you have enough room in your schedule. But if you’re already working a fulltime job then 15 to 30 minutes a day is more than enough, today and forever. Keep your commitment so small that maintaining it won’t ever be daunting. Habits become solid with repetition. Commit to doing your writing 30 days in a row with no breaks. After that, you should be solid enough to give yourself weekends off. Once your habit is secure, I think these days off are important because they give you the chance to relax and restore yourself. You can put your writing responsibilities on hold and do “fun” stuff – taking walks in the park, having lunch with friends, going to movies or concerts. These brief “off” days will make your writing better because you won’t feel like a mindless drudge who does nothing other than work. Rewards might sound childish, but they are not. Developing the writing habit is hard work and you need to reward yourself for doing it. The rewards don’t have to be unhealthy (double chocolate brownies) or expensive (a new laptop). They should be small and commensurate with what you’ve accomplished. I favour rewarding yourself daily for the first 30 days with something small, in the $5 range — a nice coffee, a specialty tea, a magazine after each writing session. Then haul out the bigger trophy, in the $100 range, once you hit the 30-day point: theatre tickets, a new piece of software or a piece of clothing. Just make it something that appeals to you so you can hold it firmly in your mind’s eye as an incentive on those days when you’re not sure you want to write. In my Get It Done program, I am the accountability partner for 20 writers. They agree to email me every day and report how many words they wrote that day or how much time they spent editing. I’ve lost track of the number of people who’ve told me that, without this accountability, they would never have written. If you’re not a part of this program, try to find an accountability partner of your own. Note that it shouldn’t be someone too close; good friends are too likely to give you a pass when you don’t meet your own expectations. Instead, try to find someone who’s enough of a stranger that you’d feel deeply embarrassed to admit that you hadn’t done the work. Recording simple numbers, such as how many words you wrote each day, can help you see that your writing practice is making you stronger. Further, the way small numbers so quickly add up, will impress and inspire you. Do you know that if you write 350 words a day for 30 days you’ll accumulate 10,500 words? I’ve written about tracking before and I still do it myself, every day. My video podcast last week aimed to help you mindmap your book. Or, see the transcript, and consider subscribing to my YouTube channel. If you have a question about writing you’d like me to address, be sure to send it to me by email, Twitter or Skype and I’ll try to answer it in the podcast. How do you deal with the need to begin again? We can all learn from each other so, please, share your thoughts with my readers and me in the “comments” section below. Anyone who comments on today’s post (or any others) by Feb. 28/18, will be put in a draw for a copy of The $100 Startup by Chris Guillebeau. Please, scroll down to the comments, directly underneath the “related posts” links, below. Note that you don’t have to join the commenting software to post. See here to learn how to post as a guest.